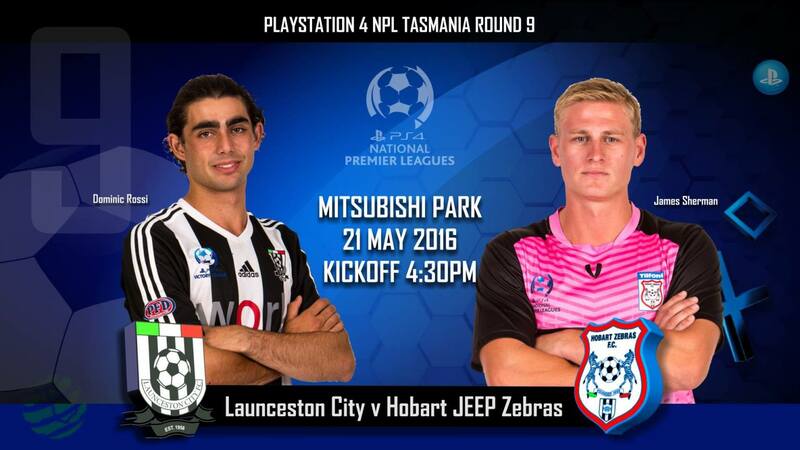 The Italian Derby was hotly contested contest right up until the last minute as expected, but it was the southerners Hobart JEEP Zebras that got the 3 points once more, Adam Mckeown hitting a brace to secure a valuable 2-1 victory despite a late rally from Launceston City. The first half was a real arm wrestle with neither side able to hit the lead and chances were hard to come by. It was the Zebras who created the first openings and they forced City keeper Dave Smith into action mid way through the first half. In the 21st minute Dwayne Walsh had a chance to put Zebras up when he got through one on one with only Smith to beat, but the big man came to the rescue as he does time after time and saved with his legs. He was called into action soon after when a free kick next to the corner flag spilled to Sherman and Mckeown at the back post who between them managed an effort on goal that forced another fine save from Smith who tipped it past the post. City finished the half strongly with Rossi starting to run amok out on the right wing. His mazey runs and crosses started to cause havoc and lead to a chance for Aaron Campbell who had his shot well blocked. But the score remained 0-0 and someone needed to bob up and be a hero for their team on the day. Zebras came out of the sheds the hungrier of the two sides and it was old trusty Adam ‘Sunday’ Mckeown that got them on their way. The goal sneak skipped past his marker in the box and almost took too long to get his shot off as a last ditch City tackle almost took his opportunity away, but the ball landed in his path and he placed it beyond Smith to make it 1-0 on the 52 minute mark. City then skipped into life forcing fine saves out of Graham Wright in the Zebra goal. First saving from Omenihu and then a corner that found Butler towering over everybody but Wright was equal to both tasks. The Zebras weathered the storm though and in the 71st minute it was that man again ‘Sunday’ Mckeown that nodded the Zebras to a 2-0 lead after Smith who felt he was unfairly nudged, couldn’t hold onto a cross falling to the Zebras attacker who made no mistake. But the game was far from over. With 15 minutes remaining, Dom Rossi took off on one of his mazey runs, finding himself with only Wright to beat before he was brought down and penalty given. After winning the penalty he finished off his fine work by scoring it, as cool as you like by sending Wright the wrong way . From that point both teams lifted and it was a frenetic last 15 minutes with it all still to play. Mckeown thought he had the sealer and his hat-trick for the evening when he had the ball in the back of the net, only for it to be disallowed. From then on it had a bit of everything. City strung a few last ditch effort corners together that were well gathered by Wright to keep City at bay and in the end it was all enough to take the 3 points back down the Midlands Highway and keep themselves right in the hunt for the PS4 NPL title. Despite the narrow loss, Lino Sciullo was happy with his sides fight and endeavour across the park, citing that Zebras were a quality outfit and that both teams had chances to get someone out of the match. The task at hand doesn’t get any easier with Peter Savill’s men coming to Mitsubishi Park next weekend. Conversely Chris Hey was happy to get back into winning ways after his sides previous two matches resulted in two draws. 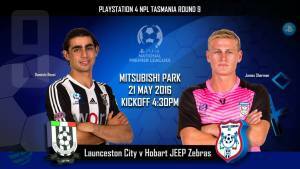 This was a test of depth to the Zebras with a few injury and illness concerns to the squad.